Rody Hopping Horse Selling Out Worldwide! The cute adorable Rody Hopping Horses made in Italy by Gymnic are taking the world by storm. Popular in Europe, Great Britain, and China they are now available in the US. They are touted to be on many, many Christmas lists this year. They come in a multitude of colors, are made of heavy duty, very super strong, soft, phthalate-free and Latex-free vinyl. They can withstand hours of bouncing. The horses can be inflated with a hand pump to suit the size and weight of your child. Originating from Italy they comply with US and international safety standards. Recommended for age 3 and up Rody Hopping Horse will delight all the small children on your Christmas list. He can easily be changed to a traditional rocking horse by the adding of a base sold separately. Rody promotes balance and coordination while providing a fun ride. Because everyone even parents want to get in on the fun Gymnic have developed Rody Max Hopping Horse. He is recommended for children age 6 and up. These adorable horses are used for fun while children learn balance and coordination. They are also being used in therapeutic situations where children have impaired coordination. The loveable Rody can be changed to a traditional rocking horse making it more enjoyable and useable for smaller children. The most sought after Rody Hopping Horse is recommended for children age 3 and up however with the addition of this base even smaller children can enjoy and fall in love with Rody. Most children would love to have their very own pony and this Rody Rocking Horse fills the bill. Rody Max Hopping Horse made by the originators of Rody Hopping Horse is especially designed for children over the ages of 6. Just like its counterpart Rody Hopping Horse, the Rody Max is in great demand. With the greater strength of the older children they get hours of fun racing each other. From Gymnic makers of the extremely popular Rody Hopping Horse comes the cute Gyffy Hopping Giraffe. Made in Italy from super strong yet soft latex-free vinyl for long lasting use this original bouncing toy is in great demand worldwide. Gyffy is so popular retailers are having a hard time keeping it in stock. Like its counterpart Rody it can easily be changed into a rocking giraffe with the addition of a base. With the run up to Christmas 2010 just around the corner this loveable toy is on a great many wish list. 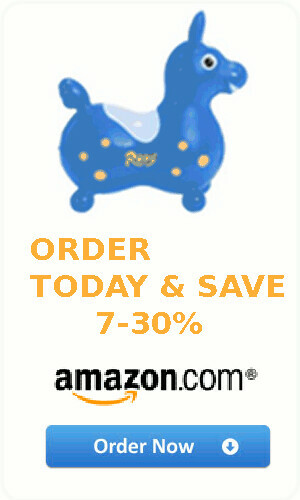 Rody Hopping Horse is a perfect affordable gift for the younger child, the older child and one adults will also love. As with all popular toys supplies are limited so don’t delay get yours today!